In 1968, the Air Force produced a short 16mm film about the EC-47, entitled Combat Cougar "Antique Airlines." Combat Cougar was one of the early cover names for the EC-47 program; Antique Airlines was the nickname of the 360th TEWS, based at Saigon’s Tan Son Nhut Airbase. As the clipping from Seventh Air Force News indicates, the interior scenes were actually shot on the ground. Jimmy Terrell, the X operator in the film, recalled many years later that “they hoisted the rear of the plane up with a crane to resemble level flight and powered it with a generator so all the lights and equipment came on. We actually locked on to a groundwave target and the Navigator printed it out to resemble actual operations.” Nonetheless, some of the navigator's equipment is obviously not powered and the "Nixie tube" frequency readouts on the X console, which were a quite conspicuous red-orange when in operation, are dark. Despite a bit of artistic license taken, this little film is historically quite significant. Although a few crew members occasionally took along their personal 8mm cameras on missions, this is the only known motion picture footage showing 6994th Security Squadron ARDF operators and a TEWS navigator working as they would have in an actual mission. Note that the navigator's station is the original side-mounted configuration. The aircraft filmed in flight during the opening seconds of the film, and later shown dropping leaflets, was equipped with the QRC-346 Electronic Warfare suite as indicated by the 6 long-wire antennas. The serial number is virtually illegible, but appears to be “123” (43-16123). The aircraft which the crew is shown boarding was 42-24313, an EC-47N. The original "Antique Airlines" film is preserved in the National Archives facility at College Park, Maryland. Thanks to D.J. Nurre for his work in digitizing, enhancing, and editing the film for viewing on ec47.com and at the ARDF exhibit, Goodfellow AFB, Texas. In 2014, forty-seven years after his "Hollywood" debut, Jimmy Terrell visited the ARDF exhibit. The photo on the left was taken at Jimmy's "fini" flight in 1968. To the right, Jimmy (L) and FTVA Heritage Chapter (San Angelo, TX) President J.J. Graham (R) stand in front of the exhibit. 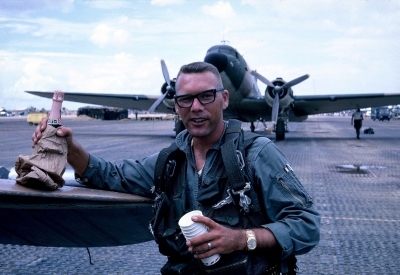 BRUCE A MEAD, in charge of the 600th Photo Squadron film crew, died at Corpus Christi, TX, 6 January 2002. He was 59 years old. BILLY JOE STAHL, the navigator, died 12 January 2010 at the age of 78. If you have information about the other "stars" of the film, please use the "contact us" feature to let us know.